The most tragic event in Finland’s history is the civil war that took place between January and May 1918. The war was about defeating a socialist revolution and an armed rebellion. Part of it was a liberation war to expel rebellious Russian troops from the newly independent country. The war and its aftermath cost the lives of 36,000 people who were killed in action, sentenced to death during the war, sentenced in special post-war tribunals and, last but not least, as victims of disease in prison camps. The war shaped the political system in Finland and left deep wounds that would take decades to heal. Democracy, however, survived and helped the nation achieve reconciliation after the rebellion. The violence of the Reds was directed at an ideological class enemy and military opponent. The revolutionaries tried to legitimise their actions by revolutionary courts, comrade courts, and punitive measures directed against counter-revolutionaries. 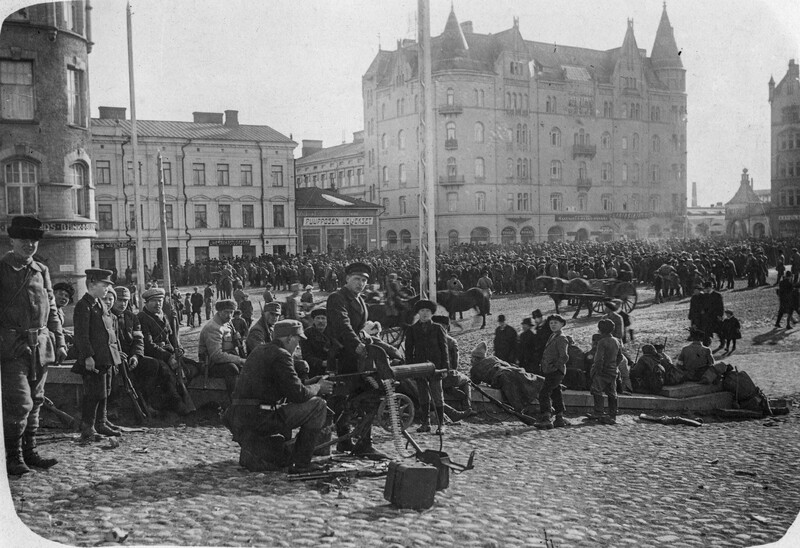 The Red administration led by Kullervo Manner gave its army free rein. Intelligence squads dispensed justice in the field. Comrade and military courts passed judgments. The People’s Delegation, which acted as a revolutionary government, had a “department of special affairs”. For the legitimate government, the legal basis of the judgments was problematic. The army applied martial law which the civilian leadership held to be unlawful. The army deployed armed flying squads in the captured areas to arrest Reds, search for weapons and carry out guarding duties. The army had military judges and courts. Commandants wielded emergency powers. Based on the emergency powers, 290 people were executed in Tampere and 247 in Vyborg. The first government of independent Finland, led by P. E. Svinhufvud, was not properly prepared for the January 1918 rebellion, even though the revolution had been in the making since November. The government was even less prepared for the numbers of prisoners taken when the rebellion was defeated. In the final stages of the war, at the end of April and beginning of May 1918, the Whites and the Germans who had intervened in southern Finland captured some 80,000 Reds or suspected Reds. The prisoners were initially under the responsibility of the army. Starting from May, the responsibility over the prisoners was shifted to the government or civil administration. There were at first 64 prison camps. By the summer, the number was down to 13. The largest camps were in Hämeenlinna (11,500), Hennala near Lahti (10,900), Vyborg (10,400), Tampere (10,000), Suomenlinna (10,000), Tammisaari (8,700) and Riihimäki (8,500). The number of Reds who died in the prison camps was 11,600. Large numbers of prisoners who were waiting for their trial in the camps or who had already been convicted, succumbed to diseases. The biggest killer was the so-called Spanish influenza, which arrived in Finland in June 1918. After the war, the government, led by Svinhufvud, and the parliament wanted to ensure the lawfulness of the dispensation of justice. Until then, justice had been dispensed on the basis of martial law enforced by the military, which the government did not consider legitimate because it was born of Russian dictation during autonomy. At the end of May 1918, the parliament passed a law on special courts for cases of treason. Based on the law, 140 new courts of law were established to handle cases of treason. Each court consisted of five members: a legally qualified chairman, a legally qualified member, an officer and two laymen. In addition, a special appellate court was instated to handle appeals. Cases were tried on the basis of the existing criminal law. These special courts processed 75,500 cases and issued 67,800 judgments. The number of people convicted of treason was 6,400. The number of people convicted of assistance to treason was 55,700. Two thousand people were convicted of robbery. Seizures carried out by members of the Red Guards were considered to be robberies. The courts ordered 555 death sentences (0.8 per cent of the convictions). Of the death sentences, 113 were carried out. The most common sentence (47 per cent of the sentences) was 2 to 3 years imprisonment. Eighty-eight per cent of those convicted were given a suspended sentence. Those who received a suspended sentence were released from the prison camp. Some 60,000 people were deprived of their citizen’s rights, which also meant a temporary loss of voting rights. The law on suspended prison sentences was approved on 20 June 1918. Most of the imprisoned Reds were released on the basis of the law. At the end of October, Svinhufvud, elected as head of state in May, converted the sentences of 10,200 prisoners, who had been sentenced to a maximum of four years, into suspended sentences. At the beginning of December, Svinhufvud reduced the sentences of 6,500 prisoners who had been sentenced to a maximum of six years. Death sentences were converted into life sentences, life sentences were reduced to 12 years imprisonment and all other sentences were reduced by one third. This decision meant that about 75 per cent of the prisoners still in prison camps on 15 September were released. At the end of 1918, there were 6,100 Reds still imprisoned, most of whom were serving their sentence in the Tammisaari forced labour camp. At the same time, Svinhufvud exonerated criminals and those guilty of summary executions who had fought on the government side. This decision has subsequently been criticised. Also the entire process has faced a lot of criticism, especially as mortality in prison camps was catastrophically high. Underlying causes included the fear of a new coup and the severe shortage of food in the country. The 1918 war events contributed to the fact that the Finnish head of state received extraordinary great powers in the 1919 constitution in comparison to the parliament. The president was given the right to dissolve the parliament, appoint and dismiss governments, be in charge of foreign policy, act as commander-in-chief of the Defence Forces and appoint the highest officials. This semi-parliamentary system survived until the year 2000.